The Super Flex Baby (スーパー・フレックス・ベビー) is a Japanese 4×4 SLR made from 1938 to 1942 or later. It was sold and advertised by the retailer Kikōdō, but manufactured by Umemoto Seisakusho. The Super Flex Baby was inspired by the Karma-Flex 4×4 SLR, with a near cubic shape modified by the film spool compartments on both sides. The body is made of die-cast alloy and the casting process itself was subcontracted to the company Tanaka Daikasuto (田中ダイカスト, meaning Tanaka Diecast). Most of the top plate is occupied by the viewfinder. The viewing hood contains a sports finder that is marked SUPER FLEX BABY inside a coat of arms. The advance knob is at the left end of the body and there are strap lugs on both sides. The back is hinged to the left and contains three red windows, protected by a common cover sliding vertically under a metal plate, inscribed 1 3 5 7 on both sides and 2 4 6 8 in the middle. The two red windows on the sides were used for the odd numbers and the central red window was used for the even numbers. The succession of numbers was thus 1, 1, 2, 3, 3, 4, etc. This complicated system was required by the 4×4cm format, for which there was no indication on the rollfilm paper backing at the time. The shutter is placed behind the lens, has two blades and is of the everset Vario type; it was manufactured by the Umemoto company itself. The speeds are set by a wheel attached to the front plate, placed at the top right as seen from the front. This wheel has B, 25, 50, 100 settings on all the models. The shutter release is situated on the right hand side of the body, as seen by the photographer. When it is pressed down, the shutter blades are closed immediately, the mirror is raised and the main spring is charged during most of the course, and the shutter is finally tripped. When it comes back to its initial position, the mirror is lowered back and the shutter blades are finally opened again. On all the models except as shown in one early advertisement, the lens is called Super Anastigmat; it is focused by turning the front element. The distance scale is engraved on the fixed part of the barrel and the set distance is indicated by a dot on the moving part, the reverse of the usual arrangement. The diaphragm ring is placed behind the distance scale. The lens is fixed on the early cameras, and it is interchangeable by way of a screw mount on the later ones. The fixed lenses are attached by three screws at the back of the front plate, not visible from the outside. They are distinguished from the interchangeable lenses by the donut ring on the front plate, surrounding the base of the lens barrel: it is thinner on the fixed-lens cameras and thicker on the others. The screw mount of the interchangeable lenses seems unique to the Super Flex Baby; the diameter measured on one surviving example is 30.54mm and the pitch is 40 threads per inch. The Super Flex Baby appeared in mid 1938: it was mentioned as coming soon in advertisements in Asahi Camera dated April and May 1938, and it was featured in the new products column of the same magazine in August 1938. The original model has a black and chrome speed wheel, and the shutter release is a simple pivoting lever. The engraving on the viewing hood is black filled. The lens is fixed and the lens barrel has a black and chrome finish too. Two surviving examples have been observed so far. The April and May 1938 advertisements in Asahi Camera showed no picture and did not indicate the focal length or the origin of the lens. The price was announced as under ¥50 in April and set to ¥49 in May. The June 1938 advertisement in the same magazine offered the camera at an unchanged price with a U.L.L. Anastigmat 75/4.5 lens by Miyoshi. It was the only advertisement to mention this lens name; the company changed the lens supplier for some reason and the camera was sold with a Super Anastigmat 7.0cm f/4.5, certainly made by Nishida. This lens was mentioned in the advertisement in Asahi Camera dated February 1939, where the camera was priced at ¥58. The contacts with Nishida were probably made through the distributor Kikōdō, which later distributed Nishida's Wester 4.5×6 folder. Two surviving examples of the original model have been observed so far. They seem to have four-digit lens numbers. One is kept by the JCII museum and the other is pictured in Sugiyama. In mid 1939, the camera was modified with an all-chrome speed wheel. Around the same time, the viewfinder logo lost its black filling and a newer batch of lenses was mounted. The newer lens has an all-chrome barrel and the focal length engraved as 70mm instead of 7.0cm; it still has a fixed mount. However some examples were still assembled with the older black and chrome lens or with the older black-filled viewfinder, certainly until the stocks ran out. The June 1939 advertisement in Asahi Camera was the first to show the new finish; the pictured example still has a black-filled viewfinder, and may have lens no.21101. The camera was listed for ¥65 and was simply called "Super Flex". It seems that this model was called Super Flex Baby II (スーパー・フレックス・ベビーⅡ型) only in retrospect after the release of the model III. Four surviving examples of the model II have been observed so far. The one pictured in this page (body no.3620, lens no.22439) is the most typical. An example auctioned in 2007 (body no.3793, lens no.7580) has the older black and chrome lens. The example pictured in Sugiyama has a black-filled viewfinder and non-original leather covering, and the example pictured in Lewis apparently received a non-original black painting on the body edges, viewfinder and shutter lever. The Super Flex Baby III (スーパー・フレックス・ベビーⅢ型), released at the beginning of 1940, has a new type of release lever consisting of a folded metal plate, vertically sliding on the right hand side of the camera. A button at the bottom of the release mechanism is used as a release lock allowing for time exposures. The model III was first advertised in March 1940, and was featured in the May issue of Asahi Camera. The April advertisement in the same magazine was still offering the model II for ¥65 along with the model III costing ¥78. It explicitly states that the difference was the ability to take time exposures. The advertising picture is the same as in June 1939, and thus shows a model II; the difference is however invisible because the photo is taken from the left side. It seems that the model III was first made with a fixed lens and later with a screw mount interchangeable lens. Four surviving examples have been observed so far. The camera pictured in Sugiyama seems to have a fixed lens, with the focal length engraved as 7.0cm; this is the only known example of this lens variant. A camera auctioned in 1992 seems to have a fixed lens too, engraved 70mm with lens no.23037. The other two seem to have an interchangeable 70mm lens. The removable lens was perhaps introduced to offer a medium-priced SLR able to take close-up pictures by way of extension tubes, or microscope pictures by way of an adapter. It seems that no such accessory was actually offered for sale, but it would certainly have been relatively easy to manufacture by a small-scale laboratory interested in using the camera for scientific or medical purpose. The modification of the shutter release was perhaps pursuing the same goal: the straight-course lever with Time exposure ability is certainly more suitable for reprophotography or photomicrography than the previous pivoting lever with B setting only. The interchangeable lens was perhaps introduced at the same time as the Super Flex Baby IIIA (スーパー・フレックス・ベビーⅢA型), a more expensive alternative with a Super Anastigmat 65mm f/3.2 lens. The model IIIA seems to have the same body as the model III with screw mount, so a III can be turned into a IIIA and vice versa by swapping the lens. Few examples of the model IIIA are known. The camera pictured in Sugiyama perhaps has lens no.4152. A camera sold at an online auction has body no.6570 and lens no.4792. A third camera was bought back by the Umemoto family and is pictured in the history page of the Umemoto company; it has body no.6854 and lens no.5342. Both models were mentioned in the list of set prices compiled in October 1940 and published in January 1941, under the names "Baby Super Flex III" (¥77) and "Baby Super Flex IIIA" (¥88). The IIIA was mentioned as "coming soon" in an advertisement in Shashin Bunka dated January 1941. An advertisement dated March 1941 in Shashin Bunka offered the model III for ¥77 and the model IIIA for ¥88. In the March 1942 advertisement in Hōdō Shashin, the prices were respectively ¥90 and ¥102, and calling the f/4.5 model "model II" was probably a mistake. No later advertisement is reported, and production was soon interrupted by the war. The government inquiry listing all Japanese cameras as of April 1943 mentions a "Super Ref" (スーパーレフ) that certainly corresponds to the Super Flex Baby. Two versions are listed: the "Super Ref II" (スーパーレフⅡ型) with a Super 65/3.2 lens and the "Super Ref" with a Super 65/3.5 lens. The source says that both lenses have three elements and were made by Nishida. It is probable that the 65/3.5 lens option is a mistake for the 70/4.5, and that the names Super Ref and Super Ref II were never officially used by Umemoto or Kikōdō and resulted from a misinterpretation by the inquiry authors. The body serial number is engraved on the fixed part of the back latch, and is only visible when the back is open. The number sequence started at 1001, literally no.001 with an additional "1" grafted at the beginning. Only three serial numbers are confirmed: no.3620 and no.3793 on Super Flex Baby II and no.6854 on a model IIIA, certainly indicating that more than 6,000 examples were made. A plausible estimate of the production rate is 150 cameras per month. At least two types of ever-ready case are known, which are pictured below. The case was certainly modified to fit the new release lever of the model III. The name "Super Flex Baby" has been used throughout this article because this is the name inscribed on the camera itself. The original documentation is not consistent: in the advertisements, the camera was often called "Baby Super Flex" or simply "Super Flex", more rarely "Super Flex Baby". (In at least one advertisement, the case was mentioned as "for the Baby Super Ref" (ベビースーパーレフ用) while the camera was called "Super Flex Baby" in the header; in another early advertisement, probably as the result of a simple misprint, it was even called the ベビースーパーレックス, i.e. "Baby Super Rex".) The official documents cited above either have "Baby Super Flex" or "Super Ref". The brand name "Super" — perhaps designed to remind people of the Zeiss Super Six and Voigtländer Super Bessa, both highly reputed and lavishly advertised in Japan at the time — was also used by the distributor Kikōdō for the Super plate folders and the Super Makinet Six. ↑ Dates: the advertisements listed in Kokusan kamera no rekishi, p.337, run from 1938 to 1942. The camera is also mentioned in the April 1943 government inquiry. ↑ The attribution to Umemoto has not been found in any original document but is confirmed by the Umemoto company history that is compiled by Umemoto Akio, grandson of Umemoto Kinzaburō, the founder of the company. ↑ Private communication to Rebollo_fr by Umemoto Akio, grandson of Umemoto Kinzaburō, the founder of the Umemoto company. ↑ Sugiyama, items 2001–4, says "interchangeable" for all the models, but this seems to be a mistake. ↑ Diameter and pitch measured by Umemoto Akio on the example pictured in the history page of the Umemoto website. ↑ Advertisements in Asahi Camera April 1938, p.A70, and May 1938, p.A68. The August 1938 article is listed in Kokusan kamera no rekishi, p.337. ↑ Advertisements in Asahi Camera April 1938, p.A70, and May 1938, p.A68. ↑ Advertisement in Asahi Camera, p.A70, reproduced in Kokusan kamera no rekishi, p.75. ↑ Kokusan kamera no rekishi, p.337. ↑ Made by Nishida: "Kokusan shashinki no genjōchōsa" ("Inquiry into Japanese cameras"), lens items K9 and K10. In this document dated 1943, the camera called "Super Ref" probably corresponds to the Super Flex Baby. ↑ Advertisement reproduced in Kokusan kamera no rekishi, p.74. ↑ Example owned by the JCII museum and pictured in this page of the Center of the History of Japanese Industrial Technology, and example pictured in Sugiyama, item 2001. ↑ Advertisement reproduced in Kokusan kamera no rekishi, p.75. ↑ Example sold as lot no.591 of Westlicht Photographica Auction no.12; see link below. ↑ Sugiyama, item 2002; Lewis, p.55. ↑ The time exposure feature is confirmed in the Umemoto history page. ↑ Example sold as lot no.334 of Christies auction "Fine and Rare Cameras", 5 November 1992. ↑ Example pictured in Watanabe, p.8 of Camera Collectors' News no.40, and example observed in an online auction. ↑ "Kokusan shashinki no kōtei kakaku" (国産写真機の公定価格, Set prices of the Japanese cameras), listing Japanese camera production as of October 25, 1940 and setting the retail prices from December 10, 1940. Published in Asahi Camera January 1941 and reproduced in Shōwa 10—40nen kōkoku ni miru kokusan kamera no rekishi (昭和10〜40年広告にみる国産カメラの歴史, Japanese camera history as seen in advertisements, 1935—1965). Tokyo: Asahi Shinbunsha, 1994. ISBN 4-02-330312-7. Pp.108—9., type 1, sections 7 and 8B. ↑ Advertisement reproduced in Kokusan kamera no rekishi, p.75. The focal length is said to be 65mm for both models but this is surely a mistake. ↑ Advertisement formerly reproduced in the Gochamaze website. Another advertisement reproduced in Nostalgic Camera by Toshio Inamura gives the same prices. ↑ "Kokusan shashinki no genjōchōsa" ("Inquiry into Japanese cameras"), items 125–6. ↑ Private communication to Rebollo_fr by Umemoto Akio, quoting his grandfather Umemoto Kinzaburō. ↑ "Ref" is an abbreviation often used for "Reflex" in Japan at the time. The katakana equivalent of "Baby Super Rex" appears in the Kikōdō advertisement in Asahi Camera, May 1938, p.A68. The change from the l of "Flex" to the r of "Rex" is insignificant: one katakakana (フ, fu) has simply disappeared. 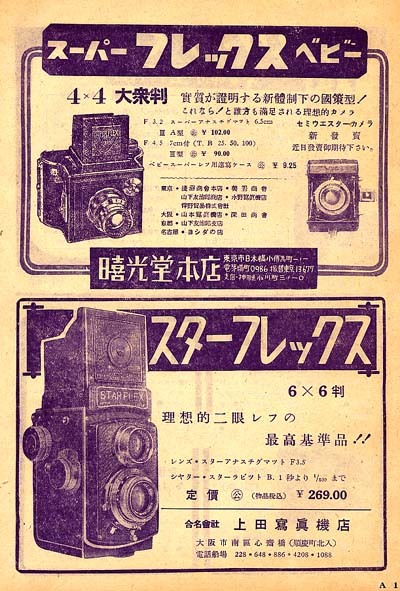 Advertisements in Asahi Camera for Kikōdō: April 1938, p.A70; May 1938, p.A68; June 1938, p.A70 (the April and May advertisements mention the Super Flex Baby as coming soon). Asahi Camera (アサヒカメラ) editorial staff. Shōwa 10–40nen kōkoku ni miru kokusan kamera no rekishi (昭和10–40年広告にみる国産カメラの歴史, Japanese camera history as seen in advertisements, 1935–1965). Tokyo: Asahi Shinbunsha, 1994. ISBN 4-02-330312-7. Items 126–8. Christies auction catalogue: "Fine and Rare Cameras", 5 November 1992, lot no.334. "Kokusan shashinki no genjōchōsa" (国産写真機ノ現状調査, Inquiry into Japanese cameras), listing Japanese camera production as of April 1943. Reproduced in Supuringu kamera de ikou: Zen 69 kishu no shōkai to tsukaikata (スプリングカメラでいこう: 全69機種の紹介と使い方, Let's try spring cameras: Presentation and use of 69 machines). Tokyo: Shashinkogyo Syuppan-sha, 2004. ISBN 4-87956-072-3. Pp.180–7. Items 125–6. "Kokusan shashinki no kōtei kakaku" (国産写真機の公定価格, Set prices of the Japanese cameras), listing Japanese camera production as of October 25, 1940 and setting the retail prices from December 10, 1940. Published in Asahi Camera January 1941 and reproduced in Shōwa 10—40nen kōkoku ni miru kokusan kamera no rekishi (昭和10〜40年広告にみる国産カメラの歴史, Japanese camera history as seen in advertisements, 1935—1965). Tokyo: Asahi Shinbunsha, 1994. ISBN 4-02-330312-7. Pp.108—9. Type 1, sections 7 and 8B. Sugiyama, Kōichi (杉山浩一); Naoi, Hiroaki (直井浩明); Bullock, John R. The Collector's Guide to Japanese Cameras. 国産カメラ図鑑 (Kokusan kamera zukan). Tokyo: Asahi Sonorama, 1985. ISBN 4-257-03187-5. Items 2001–4. Watanabe Katsumi (渡辺勝美). "Baby Super Flex" (ベビースーパーフレックス). In Camera Collectors' News no.40 (October 1980). Nishinomiya: Camera Collectors News-sha. Pp.8–9. This page was last edited on 15 August 2017, at 10:45.